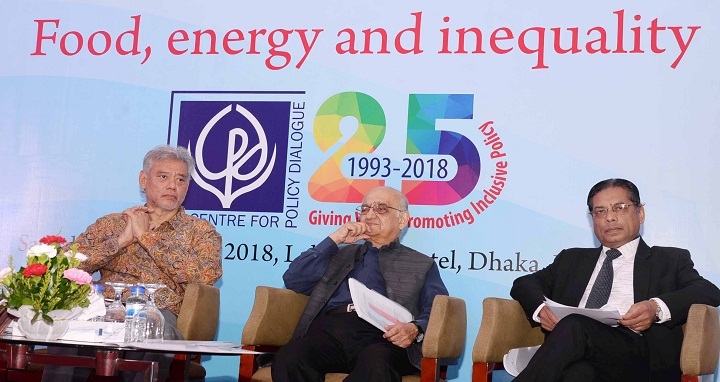 Dhaka, 8 September, Abnews: Visiting international economist Prof Jomo Kwame Sundaram on Saturday suggested that Bangladesh needs to address its malnutrition problem and ensure access to electricity through producing renewable energy. “I strongly recommend the countries like Bangladesh to pay attention to two issues. One is the question of food. Don’t leave the problem of malnutrition entirely to the Ministry of Health, rather recognise that the nutrition is a multi-dimensional,” said Prof Sundaram, an expert on political economy of development. He made the recommendation while delivering the CPD anniversary lecture 2018 at a city hotel. The second one is renewable energy to ensure modern electricity in the wake of global warming, he said adding that Bangladesh is one of the countries which is very sensitive to the problem. The sea-level rise will have profound implications not only on the future of the countries but also the future of its agriculture, he said. Prof Sundaram, currently a distinguished member of ‘Council of Eminent Persons, Malaysia, said almost all the countries have regressed from diesel to coal-fired plants. He stressed the need for government leadership to promote renewable energy and engage private enterprises in the sector. Noting that the costs of solar panels and wind turbines came down tremendously, the renowned economist questioned why Bangladesh is not producing solar panels for domestic needs and export. “Malaysia is the single largest exporter of solar panels to the USA…absolutely there’s no reason why Bangladesh can’t be a major solar panel producer not only for the needs of Bangladesh but also for export. You have all necessary ingredients, tremendous human resources. I think it’s extremely important as we’re going to reduce carbon emission in the world. Talking about the second one of the Sustainable Development Goals (SDGs), he said malnutrition is still widespread and some 800 million remain hungry which is some 10 percent of the world population. Prof Sundaram said the total costs of malnutrition may be as high as 5 percent of the global GDP, equivalent to US$ 3.5 trillion. He said there are three dimensions of malnutrition -- macronutrient (hunger), micronutrient (minerals and vitamins) deficiencies or hidden hunger and obesity (non-communication disease). “I think it’s very important to recognise that women and children suffer most from malnutrition,” said the visiting fellow at Initiative for Policy Dialogue, Columbia University, USA. He said some two billion people suffer micronutrient deficiencies and 45 percent of 6.9 million child deaths annually linked to malnutrition. Some 2.1 billion people are overweight and suffer obesity. Talking about inequalities, he said inequalities increased sharply between the 20 richest countries and the 20 poorest countries, including Bangladesh. The capital flow occurs from the poor countries to the rich ones mostly through mispricing and tax evasion.